Tim McCormack, B.S., is a computer scientist with interests in computational linguistics and biology. He provided information technology support as well as additional photographic documentation for this project. Tim has an eye for detail and is rarely seen without a camera suspended from his shoulder. 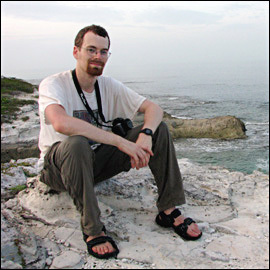 He has contributed photographs to the Charles Darwin exhibition at the Morton Arboretum, and Harvard University Press (Harvestmen: The Biology of Opiliones). Most of his photographs are made available under a free license. His public photo gallery is available at Tim's Photo Database.